Happy Hump Day! We made it half way through the work week! That's a big Yay for me! 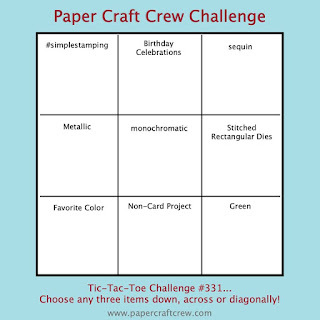 Of course Wednesday means yet another Paper Craft Crew Challenge. This week is a fun Tic-Tac-Toe Challenge... I went straight down the 3rd row for mine. So for sequins, Stitched Rectangular Dies and Green, I thought Nautical. So here's what I came up with using the Stampin' Up! Sea of Textures Bundle along with the coordinating Tranquil Textures Designer Series Paper. My card base is an A2 base of Seafoam Green Cardstock. I used the 2nd largest of the Rectangle Stitched Dies to cut a piece of the Tranquil Textures DSP and matted it with Tranquil Tide Cardstock. 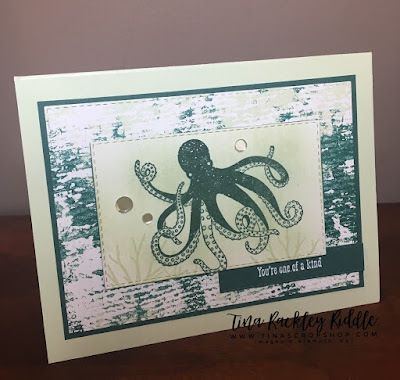 I stamped the Octopus in Tranquil Tide on Whisper White Cardstock. Once stamped, I used one of the smaller rectangles to cut it out. Seafoam Green Ink was sponged on the Whisper white after the Octopus was stamped. I also stamped some of the seagrass in Seafoam Green at the bottom of the stitched Rectangle. The sentiment "You're one of a kind" was heat embossed in White on Tranquil Tide Cardstock and I used one of the skinny rectangles to cut it out. I used snail to attached the sentiment strip and then used Dimensionals to attach the larger triangle to the center of the card. I finished it off with three Sparkling Clear Confetti Sequins by Pretty Pink Posh.